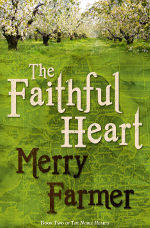 For this week’s Medieval Romance Monday, we are featuring The Faithful Heart by Merry Farmer. This is Book Two in The Noble Hearts series. “The Faithful Heart was a natural progression from The Loyal Heart. It became obvious to me right away that I had something special in the characters of Jack Tanner, Madeline Matlock, and the relationship between them. Writing their bits of The Loyal Heart was so much fun that I knew they deserved an entire story all to themselves. I’ve also always had a special place in my heart for the lives of ordinary people in the Middle Ages. Jack starts out his life as a peasant before fate takes him in a radically different direction. I always knew he was capable of greatness, but I knew that the people he would find himself surrounded by would give him a hard time. It reminds me, in a way, of growing up without money in a town full of rich people. I was lucky enough to go to private school on a sort of scholarship, but I felt the sting of being seen as inferior by my classmates. It filled me with the urge to prove myself, but not in a good way. Mostly it taught me that people can be cruel for the stupidest reasons of class and money. I drew on those experiences of inequality to tell Jack and Madeline’s story. Both Jack and Madeline have heaps of baggage to overcome before they can be together. In a way this is a coming of age story, especially for Jack. He has to make a few sacrifices that will drive my readers crazy on his road to true nobility. This entry was posted in Blogs, Medieval Romance Monday and tagged medieval romance monday, merry farmer, the faithful heart, the noble hearts. Bookmark the permalink. Merry, thanks again for participating in our Medieval Romance Monday spotlight. Best of luck to you in all your writing endeavors!